Want to change your login screen? It’s easy to do it via a GTK+ greeter for the default LightDM display manager in Ubuntu 16.04. 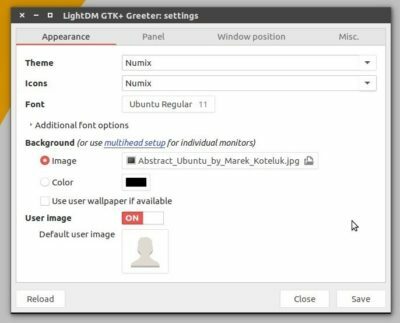 Using LightDM GTK+ greeter instead of the default Unity greeter allows users to theming Ubuntu login screen via GTK 3 themes, and icons. And there’s a simple graphical tool to configure all the settings. GTK+ themes and icon themes need to be installed in /usr/share/ directory so they are available in drop-down boxes in Appearance settings. Select GTK+ theme, icon theme, font, background image, etc in Appearance tab. 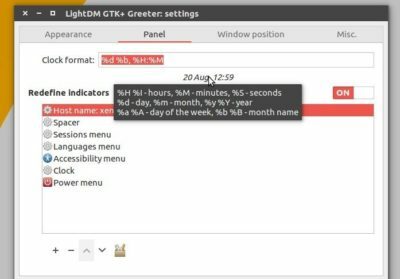 Adjust clock format, indicators in Panel tab. Adjust login box position, on-screen keyboard, reader, screen blank timeout, etc in the rest of tabs. After all, restart your computer (first time only) to apply changes. The command removes GTK+ greeter, the configure utility, and restore your login screen to the previous state after reboot. This is a very nice start to an introduction to modifying our GTK+ Greeter configuration but, when I ran the suggested command line command to put themes and icons where GTK+ Greeter could access them it reported that the ~/.themes and ~/.icons directories do not exist. If you could provide your readers with some instructions as to how to create and populate these directories with some beautiful themes and icons this would be a more complete introduction for beginners. That’s meaning you don’t have any GTK and icon themes installed on your local folder. But you can get some either from gnome-look.org (select GTK and icon themes from left panel) or by searching on Google. 1. /usr/share/themes directory for GTK theme, /usr/share/icons for icon theme — for global (system-wide) use. 2. or install to .themes or .icons for single user only. Need to manually create the folders for the first time. And the suggested commands in the tutorial is for those who have already installed some GTK+ / Icon themes in the local .themes and .icons folders, to move them to system-wide directories so that they can be used in GTK greeter settings utility. Removing the package did not restore my default Ubuntu Unity 16.04 login screen. Hi. 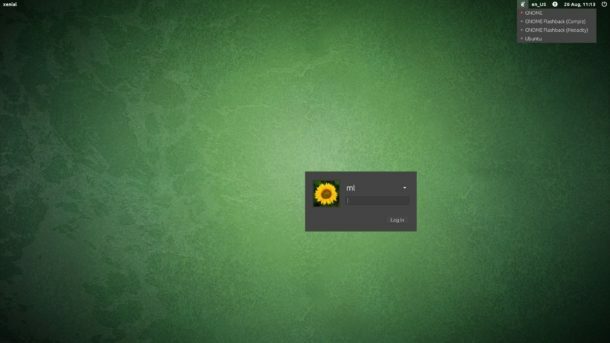 When I try to change the background image it shows a white background instead of my chosen image. How can I fix it? I tried this, it changed the greeter as in when i log out its changed. BUT the main thing i wanted was to change the greeter that i see on startup, unfortunately that stayed as the default unity greeter….any ideas anyone? I have gnome desktop installed if that makes any odds.